Compilation and assessment of drill hole results from the Imwauna Project, Normanby Property, Milne Bay Province, Papua New Guinea, has defined two significant targets for high grade mineralisation at depth (50 to 150m) below the drilled mineralisation. This compilation has been carried out as part of the resource estimate, which is in progress as was noted in our Press Release of 8th April 2008. The initial resource estimate will be based on the drill hole data in the enclosed table. 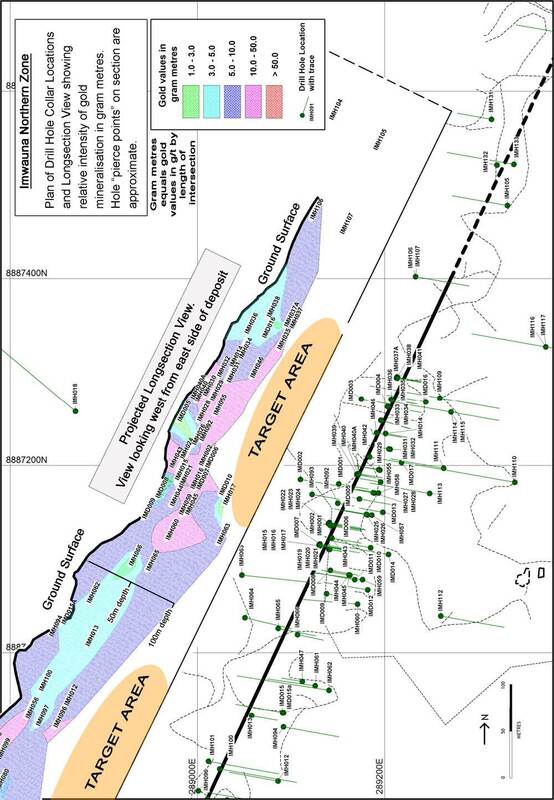 - Location plan of the presently known, drilled mineralised area at Imwauna within the overall or greater Imwauna project area. This plan also shows all drill hole collars and the anomalous gold in soil. It illustrates that only a small part of the system has yet been explored/drilled. - The composite gold content of the system is shown in long section view (a vertical section along the line of the drill holes where drill intersections are projected to a single, central, plane). On the same figure as each long section, corresponding drill hole locations, including drill hole traces, in plan view are shown. The long section shows the relative concentration of gold expressed in gram metres, i.e. g/t gold multiplied by the intersection lengths in metres. The gram metres may in some cases be composite intersections (see Table of Assay Results), and may include (added together) between one and eight separate intersections per hole. This results in a visual depiction of where the highest overall gold concentrations occur and is important in understanding the gold distribution of the system and for future exploration such as defining potential targets for further drill holes. It is not used for resource estimation. The north and south extensions are not yet completely assessed and require infill drill holes. The boundaries of each "gold zone" on the long section were determined using Surpac resource definition software. - A table showing summary drill assay, significant results (usually above a cut off of 0.5g/t gold), and location data for each drill hole. - Drilled vertical depth of mineralisation (metres below ground surface) varies from 50 to 200m and is open to depth along the entire zone. - Mineralisation is open, or extends beyond the deepest hole along the complete section - in some places with relatively high grade gold, in other places low grade gold. - Gold grades, widths of intersection and number of intersections across the zone are variable with two higher grade gold zones, approximately 300m apart, separated along strike by a lower grade zone. - The central part of the drilled zone appears to be increasing in grade and width with depth. This points to a significant target for future drilling and future addition to resources. - The higher grade mineralisation at the northern end of the drilled zone is still open at depth. - The system is open to both the north and the south. - Only a 1.5km long zone, within the overall 5km by 2km area with known gold mineralisation, has been intensively drilled, and potential to extend known gold mineralisation beyond the drilled area is excellent. Bob McNeil CEO and Chairman commented: "a system such as the Imwauna System which appears to extend over a wide zone five kilometres in length still requires large numbers of drill holes to determine its ultimate potential. As can be seen from the diagrams, drilling will have to continue for a number of years yet to determine the full potential. Although the main gold zone is more or less continuous there are rapid changes in widths and gold grades. In addition multiple intersections, including parallel veins and discordant "splits", complicate the overall interpretation. The increasing grades with depth in the central part of the system and the likely further extension to depth of the northern high grade zone are exciting in terms of the possibility of defining more high grade mineralisation. In addition, the potential for additional gold mineralisation away from the present drilled area based on a few reconnaissance drill holes, geophysics, soil geochemistry, trenching and rock sampling is excellent. At this point in time we are on track to announce the initial resource estimate, based on the first 140 holes drilled for which assays are available, about mid June, with the independent NI 43-101 being filed on SEDAR before the end of July. Drilling continues with assays for at least a further 10 holes pending." No results used in resource calculation means all results less than cut off of 0.5g/t gold or narrow intersections usually less than one metre and 1g/t gold which appear not to have continuity. The Imwauna project is located within the Normanby Property, southeast Papua New Guinea. The Company owns 100% of this property. Imwauna is the second of the Company's key gold projects. The Imwauna project contains defined gold mineralisation scattered over approximately 10 square kilometers, and occurs in the same geological zone and is along structural trend from Placer Dome's former Misima Mine (5 million ounces of gold). It was selected by management for a major evaluation program in 2006 to extend the known mineralisation and to build a substantial resource base. Two drill rigs have been used on the project through much of 2007. Both rigs are owned and operated by the Company. Approximately 150 holes have now been drilled at Imwauna (over 200 on the property), with most results available on NGG's web site (all except most recent drill holes yet to be announced). - The Imwauna Project is, at present a 1.5km long structural zone, up to 100m wide, with several, semi continuous zones of gold mineralisation. 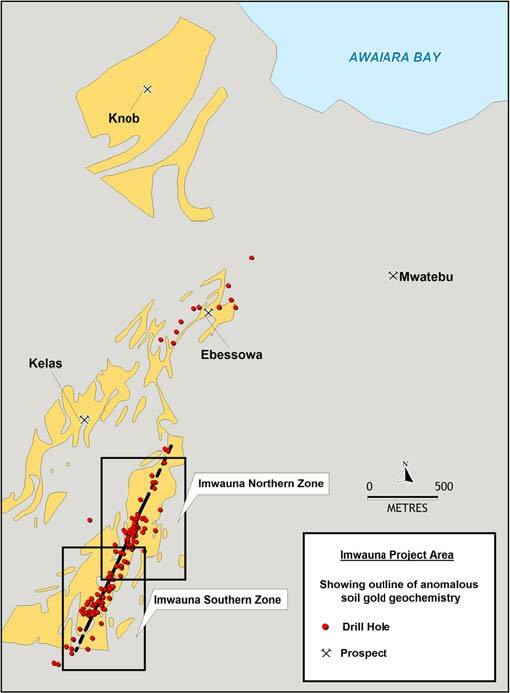 The Imwauna Project, in turn, is within a 5 km by 2 km Zone with extensive surface gold anomalism in soils and rock chips, most of which remains to be explored in detail. - Historical inferred resource, based on initial 15 drill holes, of 990,000 tonnes of 6.1g/t gold and 12g/t silver for 194,000oz gold and 382,000oz silver. - Drilling to define resources and the potential of the property is in progress. Resource estimate is expected in mid 2008 with the new NI 43-101 report by end of July 2008. - Best drill results such as 3.7m of 94.4g/t gold and 7.2m of 16.5g/t gold. - Trial mining completed - had an average grade of 14.1g/t gold over a 2.2 m mining width. - Bulk sampling of 38 excavator trenches over 1,240m strike length averaged 26.4g/t gold over an average of 1m width in central high grade part of the system with likely open pit mining width defined as 3 to 4 metres. Drill core is logged and split (all by saw) on site with half core being dispatched to, and assayed by accredited laboratory ALS-Chemex in Townsville, Australia. In house and laboratory standards are used for quality control plus regular check sample assaying. Trench samples are continuous channel samples, in either one or two metre intersects. Usually about 3kg is collected and prepared and assayed at ALS - Chemex in Townsville, Australia. New Guinea Gold Corporation has disclosed historical resource estimates for the Imwauna (Normanby) project. However, these resource estimates have been based on historical estimates and have not been verified and supported by NI 43-101 compliant, independent technical reports. As such, the historical resource estimates cannot be relied upon until they have been verified and supported by NI 43-101 compliant technical reports. In addition to the Imwauna Project the Company has commenced gold production at its Sinivit Gold Mine, in East New Britain, Papua New Guinea (see Press Release dated 8th April 2008). The Company also owns an approximate 50% interest in Australian Securities Exchange listed company, Coppermoly Ltd and in Pacific Kanon Gold Corporation which is intended to list on the TSX-V in the near future. Investors are cautioned that the development of Sinivit is proceeding in the absence of a full feasibility study. These evaluations are preliminary in nature and are based entirely on indicated mineral resources, which have not been categorized as mineral reserves. There is no assurance that the operating and financial projections in the preliminary assessment will be realized. Mineral resources that are not reserves do not have demonstrated economic viability. 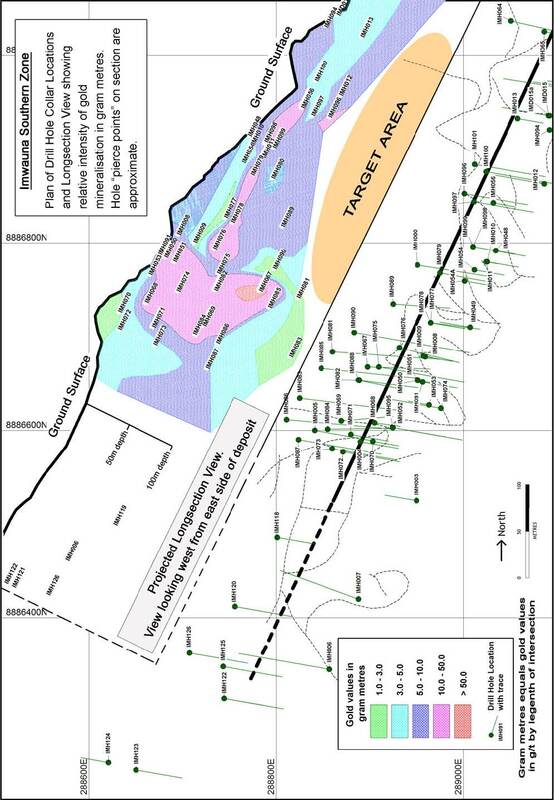 Measured and indicated mineral resources are that part of a mineral resource of which quantity and grade can be estimated with a level of confidence sufficient to allow the application of technical and economic parameters to support mine planning and evaluation of the economic viability of the deposit.